This recipe is gluten-free, dairy-free, soy-free, nut-free and vegetarian. This recipe was inspired by Bobby Flay’s, “Grilled Sweet Potato and Green Onion Salad.” I loved the flavors of Bobby Flay’s recipe and wanted to create a complete meal which included protein and vitamin-rich leafy greens. Notes: You can parboil potatoes and cook quinoa up to one day prior to making this recipe. Place potatoes in a large saucepan, cover by an inch with cold water and bring to a boil over high heat. Cook until just cooked through but not soft, about 20-25 minutes. Remove from water and let cool. Cook quinoa according to directions and let cool. Rinse scallions, brush with olive oil and season with salt and pepper. When sweet potatoes are cool enough to handle, slice crosswise into ½-inch thick slices (must be fork-tender), brush with oil and season with salt and pepper. Grill the sweet potatoes until slightly browned and cooked through, about 1½ minutes per side. Grill scallions until slightly charred and softened, about 4 minutes. Cut grilled potatoes into cubes and chop the scallions. 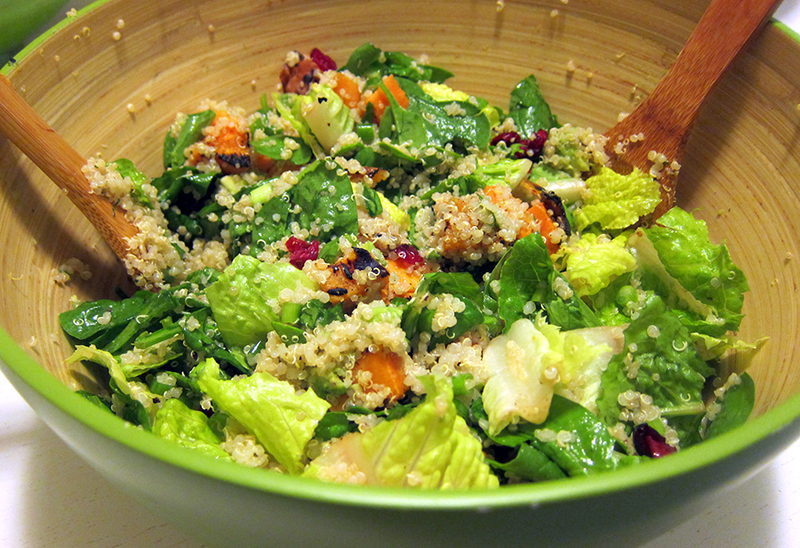 Toss greens, sweet potatoes, dried cranberries, scallions and cooled quinoa in a large bowl with the vinaigrette. This is a great one-dish meal to serve at room temperature, which makes it easy to bring to a BBQ or as an easy week-night dinner. 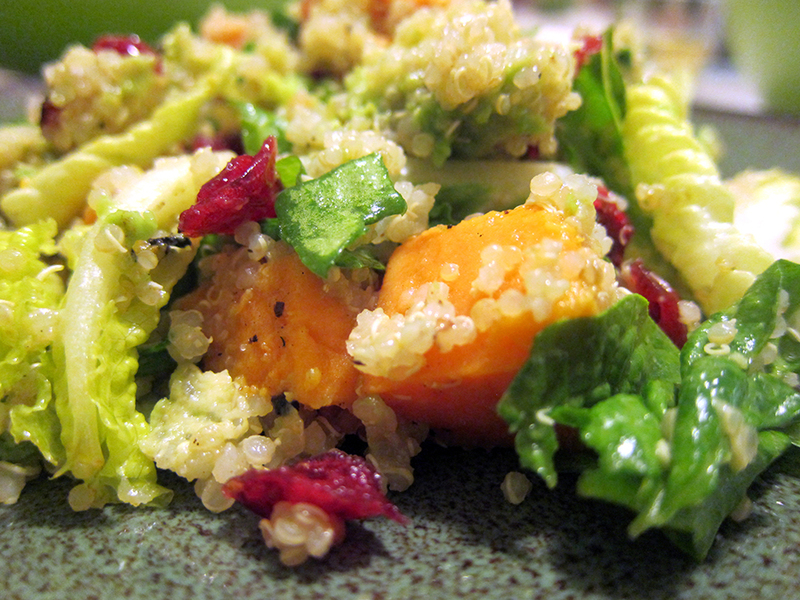 Sweet potatoes and spinach are packed with Vitamin A and C, providing antioxidants and fiber, while the quinoa is a delicious, protein-rich addition to this simple salad.